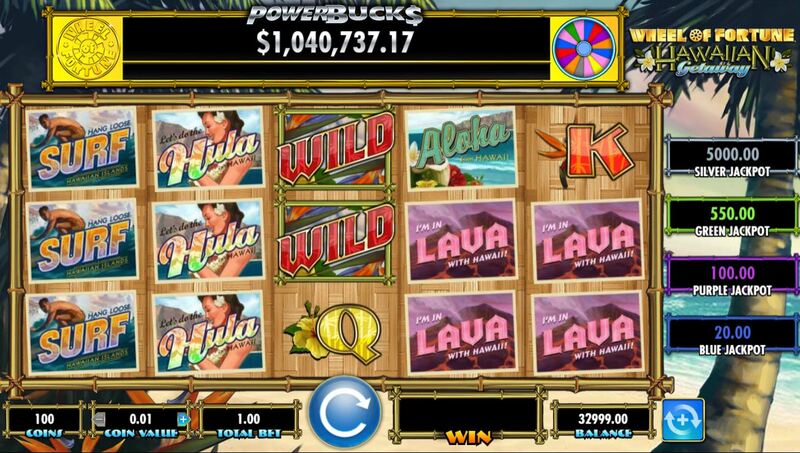 Powerbucks Wheel of Fortune Hawaiian Getaway slot by IGT is here! 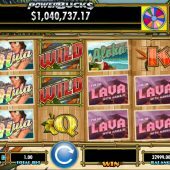 Powerbucks Wheel of Fortune Hawaiian Getaway slot is firstly a very long and convoluted name so we'll call it simply Hawaiian Getaway from hereon in. So we have yet another manifestation of the IGT Wheel of Fortune (WOF) series based on the old US TV game show to accompany the On Tour, Hollywood Edition and Triple Extreme versions to name but three. Here we have a flowery Hawaiian welcome with the expected Aloha style music from the islands in the background and tropical beach behind the reels as our setting. So now we've landed in Hawaii, will our bankroll be gifted with a welcoming lei here or will those big wins get away yet again? We have 5 reels of 3 rows each and 50 win lines on Hawaiian Getaway with all symbols stacked including Wilds and scatters. The pays though are lamentable with the 5-of-a-kinds being 25 coins or 0.5x bet for the Surfer, 20 coins for the Hula Girl, Tiki Statue 18, Aloha and Lava 14 with four card values paying either 12 or 10 coins. The only hope of a significant win comes in the in-play respins modifier. Right, you need to see 3 or more adjacent reels full of one of the stacked picture symbols. You'll notice each spin a symbol seems to be selected randomly to be super-stacked on all reels although this can be any of the paying ones and not just the 5 picture icons. You get paid for the 3-reel picture symbol win. The 3 reels then transform into only 3x3 colossal picture symbols and respin along with the other 2 reels. If a 4th. reel matches what lands on the 3, you get paid again and then the 5th. reel respins with the 4 adjacent reels spinning as colossal 3x4 symbols. If you match the 3x4 symbol with a matching reel 5 then you are paid and get one final respin with the reels spinning only with 3x5 colossal symbols for a guaranteed full screen hit. You also get a random 2,3,4 or 5x multiplier applied to this whole series of repsins. 10 free games - which can be retriggered and in those the 3-reel Big Kahuna Respins seem to occur more often. Cash Values - from 1 to 10x bet. A jackpot game - this offers 4 fixed jackpots of 40, 200, 1100 or 10,000 x bet which will vary according to your stake. These amounts are shown to the right of the reels. If you bet below 3.00 a spin (the minimum is 1.00 or 100 coins) you will only see those fixed jackpots or coin prizes on the wheel. Powerbucks - if you bet 3.00 or more, then the jackpot game can also offer the main Powerbucks progressive jackpot seeded at $1million in your currency. Pointer Frenzy - you will see anything from 1 to 6 of the inactive pointers to the left and right of the pointer at the top get activated. This means you could win free games, and the jackpot game and cash on the same spin.